A new rubber compound with ultra-high connectivity has been developed that could give robots skin. The new material means the robots could sense heat and pressure, in a rudimentarily similar way to human skin. The pivotal achievement is making the material both flexible and conductive, as rubber is stretchy but essentially an insulator, and metal cannot be continually reshaped. 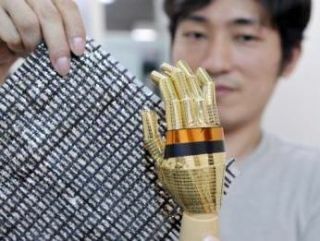 However, the new compound can stretch to 1.7 times its size without losing conductivity, and is 570 times more conductive than other rubber materials. "As robots enter our everyday life, they need to have sensors everywhere on their bodies like humans," Tsuyoshi Sekitani, a research associate in the team, told AFP. "Imagine they bump into babies. Robots need to feel temperatures, heat and pressure like we do to co-exist. Otherwise it would be dangerous." The material could also be used in everyday objects, like steering wheels, allowing measurements to be taken on whether a person is fit to drive. "It could be completely integrated into the normal driving system, making users unaware of using it," Sekitani added. "Objects that come into contact with humans are often not square or flat. We believe interfaces between humans and electronics should be soft."